ESC’s Ron Bell OBE and David Green will be presenting on Proof Testing “Proof Testing… A key performance indicator for designers and end users of Safety Instrumented Systems” at Hazards on Friday 12th May. 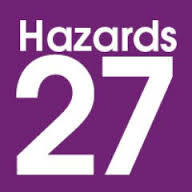 Hazards is held annually in the UK and next takes place on 10th to 12th May 2017 at the International Convention Centre (ICC) in Birmingham. Proof Testing is a key performance indicator with respect to the achievement of functional safety and the paper sets out a structured approach to the development of Proof Test Procedures for Safety Instrumented Functions (SIFs) within the process sector and guides the reader through a five stage process to ensure the development of robust Proof Test Procedures. This requires addressing both the technical requirements and the competence requirements of those having responsibilities for Proof Testing. This staged approach has been established based on two decades of operational experience by the principal author, within top tier COMAH establishments within the UK, and subsequent consultancy work within multiple industry sectors. Stage 5: Review of the Proof Test Procedures to assess the their effectiveness. Current good practice in the process sector, with respect to functional safety, is to achieve compliance with IEC 61511  and IEC 61508 . The approach adopted by HSE is to benchmark the functional safety achieved, including Proof Testing, against requirements in IEC 61511  and IEC 61508 . Please head to the IChemE website to see the full program and to register. IEC 61511-1, Functional safety – Safety instrumented systems for the process industry sector. Edition 2, 2016, Corrigendum edition. IEC 61508, Functional Safety of Electrical/ Electronic/ Programmable Electronic Safety Related Systems. Edition 2, 2010.